Editor’s Note: For its third post, RealForecasts.com is re-publishing a white paper titled “‘Deep Survival’ In Real Estate Investment Management – How To Survive (and Even Thrive) in 2009”, which was written in January of 2009. The advice applies to challenging situations today as much as it applied to the challenging market conditions we were going through almost five years ago. In his book Deep Survival: Who Lives, Who Dies and Why (New York: W.W. Norton & Company, 2003), Laurance Gonzales alternates compelling storytelling with first-rate scientific research to describe the art and science of survival. Although aimed primarily at wilderness travelers and extreme sports enthusiasts, Deep Survival is also a useful guide for anyone facing one of life’s great challenges. Gonzales divides his book into two parts. In the first part, titled How Accidents Happen, Gonzales provides examples of people who got into trouble and how they got there. In the second part, titled Survival, he explores the character traits and behaviors of those that survived life-threatening situations. The real estate investment management business is not a life or death environment. But the downturn in the economy is presenting challenges to our firm and our competitors that will undoubtedly change the landscape in our industry. Gonzales’ lessons provide a roadmap to not only survive, but also maximize opportunities during the downturn. 1. Perceive and Believe: Even in the initial crisis, survivors’ perceptions and thought processes keep working. They notice the details. If they experience any denial, it is counterbalanced by strong confidence in the information provided by their five senses. They immediately begin to recognize, acknowledge and even accept the reality of their situation. In the sport of orienteering, competitors have to navigate across unfamiliar terrain using a detailed map. If they ever start saying to themselves, “Well, that lake could have dried up,” or “That mountain could have moved,” they are doing what orienteers call “bending the map”. They are denying the reality before them and substituting the world they would rather see. During 2009, we need to avoid “bending the map” and accept that market occupancy and market lease rates will decrease. We need to be prepared to meet the market when negotiating with both existing and prospective tenants. Similarly, we need to accept that required rates of return will continue to increase and property values will continue to decrease, especially for properties with higher risk profiles. If we do not have to sell, we need to prepare ourselves and our clients to hold their investments through the dip. If we have to sell, it will be best to do so sooner rather than later. Conversely, unless there is a very compelling opportunity, investors with capital should keep their powder dry and wait for the market to find a bottom before making new investments. 2. Stay Calm: In the initial crisis, survivors make use of fear and avoid being ruled by it. Their fear often feels like and is turned into anger, which motivates them and makes them sharper. They understand at a deep level the need to stay calm and are on constant guard against giving in to their emotions. They use humor to keep the situation in perspective. Those who can learn to think clearly and make good decisions under stress or in high emotional states are more likely to survive. Market conditions will likely get worse before they get better. We need to remain calm and remind ourselves that conditions will eventually improve. They always have. They will again. In the meantime, we need to stay focused on maximizing property performance and strengthening our relationships. 3. Think/Analyze/Plan: Survivors quickly organize, set up routines and institute discipline. They push away thoughts that their situation is hopeless. A rational voice emerges and is often actually heard, which then takes control of the situation. Survivors describe this experience as a feeling of “splitting” into two people and then “obeying” the rational one. It begins with the paradox of seeing the stark reality but acting with the expectation of success. We need to be realistic about the difficulty of the market conditions we expect to encounter during 2009 and 2010, but optimistic about our ability to succeed in the face of these conditions. That is very different from simply being optimistic about expected conditions. 4. Take Correct, Decisive Action: Survivors are able to transform thought into action. They are willing to take risks to save themselves and others. They are able to break down very large jobs into small manageable tasks. They set attainable goals and develop short-term plans to reach them. They are meticulous about doing those tasks well. They deal with what is within their power from moment to moment, hour to hour and day to day. They leave the rest behind. Although we cannot do anything about the increasing rates of return and the decreasing lease rates we will encounter in the coming year, we can take steps to maintain and build our relationships with our clients. We can also take steps to maintain and build the occupancy of our properties and portfolios. And rather than waiting for one large tenant to lease a large block of vacant space, we need to be prepared to break it up into smaller increments to attract smaller tenants – which are typically more prevalent in the market. 5. Celebrate Successes: Survivors take great joy from even their smallest successes. That is an important step in creating an on-going feeling of motivation and preventing a descent into hopelessness. It also provides relief from the suffocating stress of a true survival situation. Most inexperienced mountain climbers make the mistake of celebrating on the summit, even though the hardest part of the trip is still before them — getting back down. Experienced climbers know that most accidents happen on the way down, when they are tired and more likely to drop their guard. Companies and even individual careers are subject to the same rules: We are most vulnerable at the top of the market and at those times when we feel most secure and confident. Like inexperienced mountain climbers, most companies do not plan for the trip back down. During 2009, we need to take time to celebrate our successes, no matter how small. 6. Count Their Blessings: This is how survivors become rescuers instead of victims. There is always someone else they are helping more than themselves, even if that someone else is not present. As Steve Furnary said in his year-end message, we have much for which to be thankful. We have a great company, made up of great people and excellent relationships with over 250 clients. We have also reported great returns over the past several years, which will continue to show up in our reported returns going forward. 7. Believe That They Will Succeed: All of the practices just described lead to this point. Survivors consolidate their personalities and fix their determination. Survivors admonish themselves to make no more mistakes, to be very careful and to do their very best. They become convinced that they will prevail if they do these things. Down markets provide an opportunity for great companies to distinguish themselves from their competitors and actually increase their market share. To paraphrase Warren Buffet, no one can tell who is swimming naked until the tide goes out. We are already capitalizing on this opportunity as we take over properties and portfolios from competitors such as Morgan Stanley and RREEF. Somebody is going to come out on top during this next phase of the market cycle. It might as well be us. 8. Surrender: This sort of thinking has been called “resignation without giving up” or “survival by surrender.” A climber recognizes that he will probably die, doesn’t let it bother him and goes ahead and crawls off the mountain anyway. Survivors also manage pain well. One woman, who walked out of the Sierra Nevada Mountains after surviving a plane crash, wrote that she “stored away the information” that her arm was broken. It will be painful as our values continue to decline during 2009. We will have to make some difficult decisions – accepting lower than pro forma rents, leasing to higher risk tenants, even selling at a loss. We need to “put away” that pain and focus on the things we can control, including our relationships with our clients, with our tenants and among ourselves. The short-term pain will pay off when we are able to enjoy the long-term rewards. 9. Do Whatever is Necessary: Survivors have “meta-knowledge” – loosely defined as “knowledge about knowledge.” They know what they know and they know what they do not know. In particular, they know their abilities and do not over or under estimate them. That said, they still believe that anything is possible and act accordingly. Play leads to invention, which leads to trying something that might have seemed impossible. Survivors do not expect or even hope to be rescued. They are coldly rational about using the world, obtaining what they need and doing what they have to do. It will not do us any good to wait around for the Fed, the White House or Congress to rescue us from our current situation. We need to take responsibility for our own attitudes and our own actions and do what we have to do for our clients, our company and ourselves. 10.Never Give Up: Survivors are not easily frustrated. They are not discouraged by setbacks. They accept that their environment is constantly changing. There is always one more thing that they can do. They pick themselves up and start the entire process over again, breaking it down into manageable bits. Survivors always have a clear reason for going on. They keep their spirits up by developing an alternate world made up of rich memories to which they can escape. They then mine those memories for whatever will keep them occupied. They come to embrace the world in which they find themselves and see opportunity in adversity. In the aftermath, survivors learn from and are grateful for the experiences they have had. In Deep Survival, the wilderness is a metaphor for all of life’s challenges. And the survivors of these challenges have universal lessons to teach us all – even those of us traveling through the wilderness of real estate investment management during 2009. This entry was posted in Investment Strategy, Real Estate on October 23, 2013 by Jeff Peshut. Editor’s Note: This is the second post for RealForecasts.com. For its second post, RealForecasts.com is re-publishing a white paper titled “Is There a Real Estate Bubble?”, which was written in September of 2005. Not only were there were bubbles in both the residential and commercial real estate capital markets, but the bursting of these bubbles that began in August of 2007 precipitated the greatest economic downturn in the U.S. since The Great Depression of the 1930s. The question on the minds of most real estate investors today is whether there is a “bubble” in the real estate capital markets and, if so, when will it “burst”. I wrote the [previous post titled “Will Market’s Boom/Bust Cycle Repeat?”] in mid-1998. The question then was whether there was a bubble in the stock markets and economy and, therefore, the real estate space markets. Hindsight tells us that there was in fact a bubble in all three. These bubbles burst about 18 months later. 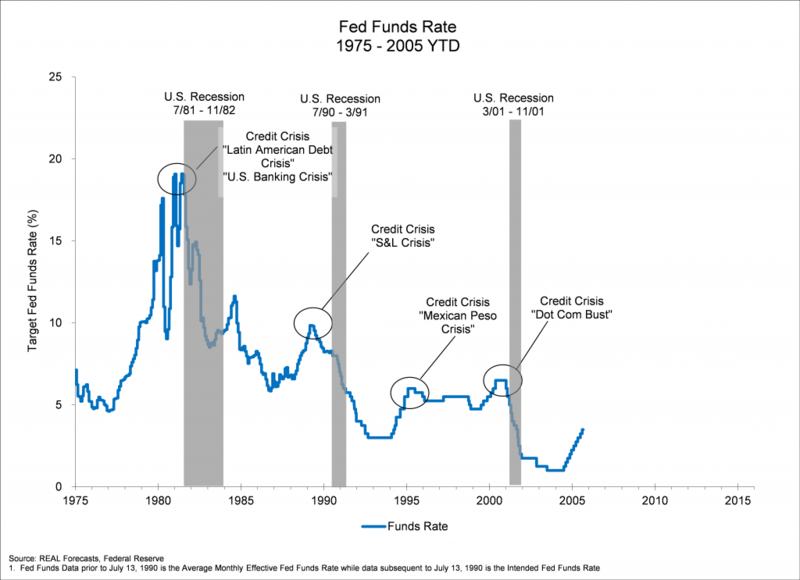 – We are once again nearing the end of a “credit-fueled” bubble similar to the credit-fueled bubbles that ended during the late 1980’s and late 1990’s. – The Federal Reserve and commercial banks cause these bubbles by artificially expanding the supply of money and credit. The Fed expands the supply of money and credit by buying Treasury Bills in the open market or by lowering the discount rate as a means of lowering short-term interest rates. This expansion of the money base is magnified by the impact of fractional-reserve banking. 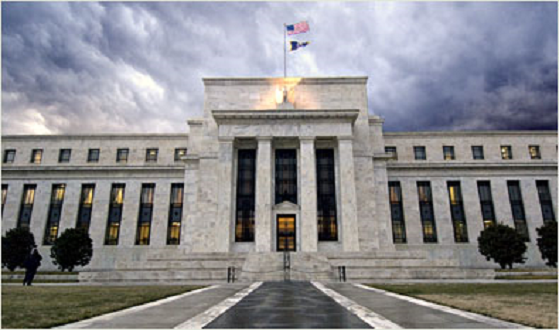 – When the Fed pumps money into the economy, interest rates drop — at least at first. – As the commercial banks’ reserves increase and interest rates decrease, businesses take out bank loans to invest in projects that weren’t profitable at the higher interest rates previously set by the free market. As businesses hire workers and buy equipment and raw materials to implement their investment plans, the economy picks up and the boom phase of the cycle begins. – The boom, however, is founded upon an illusion. The government appeared to enlarge the pool of savings available for businesses to invest, but in reality it created money that didn’t exist before. It’s this money that was created “out of thin air” that creates the bubble. – After all, the government can’t create wealth or real savings. It can only confiscate and redistribute existing wealth through taxation or inflation. When the Fed reduces interest rates by inflating the money supply, it in effect confiscates part of our wealth by inflation and lends our money to borrowers at the below-market rates referenced above. – This subsidized interest rate sends a false signal to businesses, encouraging them to invest in projects that consumers weren’t in fact willing to pay for. – Alas, all credit-fueled bubbles must end. Otherwise, we risk hyper-inflation or a collapse in the value of the dollar relative to other currencies. – To end the bubble, the Fed must reverse its earlier policy and contract the supply of money and credit. – During the late 1980’s, concerns about the rate of inflation for goods and services and a weak dollar lead the Federal Reserve to drastically tighten credit and end the bubble. During the late 1990’s, “irrational exuberance” in the stock market led the Fed to tighten credit and end that bubble. Today, concerns about a “housing bubble” and a weak dollar seem to be the impetus behind the Fed’s increasingly tight monetary policy. – When credit-fueled bubbles end, they burst. And when they burst, the ill-advised investments that businesses made during the period of the Fed’s loose monetary policy are exposed. According to this line of thinking, the question of whether the “bubble” in the real estate capital markets will “burst” becomes not “if” but “when”. And once it does, by “how much” will values decline. If So, When Will It Burst? 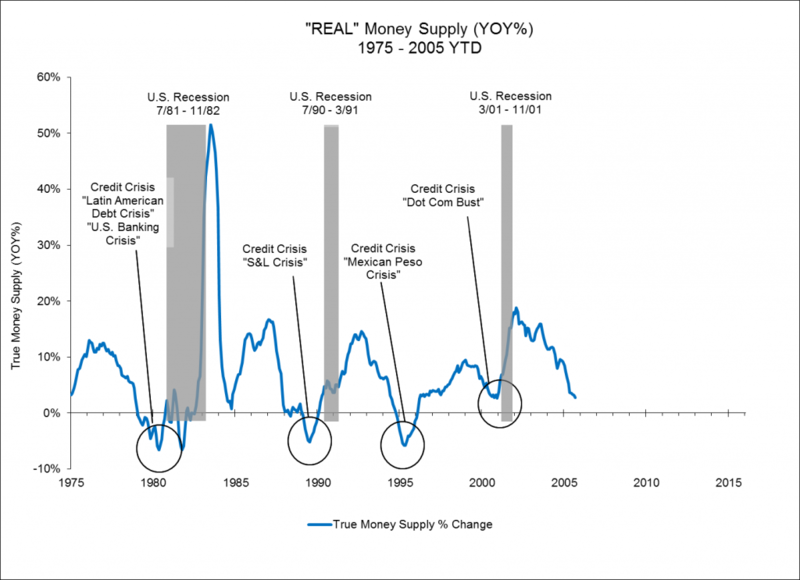 – During what is arguably the most recent “credit-fueled” bubble, the rate of growth in the money supply reached a peak in early-2002 and again in early-2004, before beginning its current descent. Again, this correlates closely with the Fed’s loose monetary policy from late-2000 through early-2004 and its tight monetary stance since early-2004. It also correlates closely with the most recent run-up in prices in the residential and commercial real estate capital markets. – Recently, [RMS has] been increasing at a decreasing rate. “Real [RMS]” ([RMS] adjusted for price inflation) correlates closely with changes in Industrial Production – a key measure of economic activity — with a 12-month lag. “Adjusted [RMS]” ([RMS] adjusted for price inflation and economic activity) correlates closely with changes in the stock markets, with a 4-month lag. If past is prologue, the effect of the Fed’s current tight monetary stance on the money supply’s growth rate creates a significantly heightened risk of a slowdown in economic activity, a correction in the stock markets and a correction in the real estate capital markets in the year ahead. How Much Will Values Decline? – From 1995 through 2004, the spread between going-in cap rates and the 10-year Treasury averaged 320 bps. – A year ago, going-in cap rates and 10-year unlevered IRR’s were 7.0% to 7.5% and 8.25% to 8.75%, respectively. These going-in cap rates represented a spread of approximately 280 to 330 bps over the 10-year Treasury, consistent with the historical average. – Today, going-in cap rates and 10-year unlevered IRR’s are 5.75% to 6.25% and 7.0% to 7.25%, respectively, for “core” real estate investments. The going-in-cap rate represents a spread of approximately 155 to 205 bps to today’s 10-year Treasury. – This spread is not only narrow for cap rates, but would also be narrow for commercial mortgage spreads. From 1996 through year-to-date 2005, the spread between commercial mortgages and the 10-year Treasury averaged 190 bps. – According to L.J. Melody, today’s rates for fixed-rate commercial mortgages are 4.9 % to 5.5% for the four major property types. These rates represent a spread of 70 to 130 bps over the 10-year Treasury, approximately half the historical average. – Therefore, it appears that last year’s cap rate levels were sustainable based upon historical averages but that the 125 bps decline in cap rates and IRR’s during 2005 will prove to be unsustainable. – For a property with NOI of $5 million, a 125 bps increase in today’s going-in cap rates would result in a decline in value of 17% to 18%. It is important to note that this decline in value reflects only a return of the going-in cap rate spread to its historical average. It does not reflect a change in the 10-year Treasury rate. – It is also important to note that a 17% to 18% decline in value requires a 20% to 22% increase in value to return to the value that existed before the decline. One final observation: Once bubbles burst and market values decline, market values typically take a long time to recover. For example, five years after the bubbles in the stock markets burst, the Dow Jones Industrial Average is still only 90% of the all-time high it set in early-2000. Similarly, the S&P 500 Index and the NASDAQ Composite Index are only 80% and 45%, respectively, of their 2000 all-time highs. Therefore, once the real estate bubble bursts, it could take several years before real estate values return to the levels they achieved at the height of the bubble. This entry was posted in Economics, Market Forecasts, Money, Real Estate on October 17, 2013 by Jeff Peshut. Will Market’s Boom/Bust Cycle Repeat? Editor’s Note: This is the inaugural post for RealForecasts.com. For its first post, RealForecasts.com is re-publishing an article titled “Will Market’s Boom/Bust Cycle Repeat?”, which appeared in the June 17-June 30, 1998 edition of the Colorado Real Estate Journal. Today, we know the answer to the question posed by the article. The market’s boom/bust cycle did repeat — a mere 18 months later. Contrary to recent media reports, the pending sale of Miller Global Holdings’ eight-building metro Denver office building portfolio to Chicago-based Equity Office Properties LLC for $394 million will not be the largest commercial real estate transaction in Colorado history. That honor goes to a transaction completed in the early-1980s by Miller, Klutznick, Davis and Gray, another Miller-led organization. Denver real estate veterans will recall that MKDG sold the 3-million square foot City Center complex to Prudential’s “PRISA” fund for $500 million in 1983-1984. Completed at the apex of an unprecedented economic and real estate boom, the sale included buildings known today as Johns Manville Plaza (f/k/a Petro Lewis Tower), MCI Tower (f/k/a ARCO Tower), First Interstate Tower North, 1801 California Street (f/k/a City Center IV) and the 615-room Marriott Hotel. Within less than two years of MKDG’s sale to Prudential, however, Denver’s economy and real estate market descended into one of the worst bust cycle’s in the city’s history. The question for market watchers today is whether Miller Global Holdings’ sale to Equity Office Properties signals the top of this market cycle or whether the sale is the harbinger of a “new era” that is immune from the boom/bust cycles that have plagued the Denver economy and real estate market in the past. Those who believe we are entering a new era — where the old rules no longer apply — advance a number of arguments in favor of their view. With respect to the national economy, they argue that the break up of the Soviet Union and the end of the Cold War freed up investment capital for productive uses, instead of being frozen in non-productive military uses. They say that this new capital has, in turn, been leveraged by advances in computer technology, creating unprecedented increases in productivity, low unemployment and low inflation. Nowhere is this more apparent than in Colorado. Today, the state’s unemployment hovers just above 3 percent, with moderate inflation of only 3.4 percent. Further, most business leaders believe that the state’s over-reliance on the energy industry caused the deep recession of the late 1980s. These leaders now point to a more diverse economy as the primary reason why a sharp economic downturn will not recur. Real estate pundits also argue that the massive overbuilding of the 1980s was caused by a combination of the savings and loans — and other financial institutions — eager to make loans and passive tax laws that offered developers incentives for building. They point out that neither condition exists today. They say that even though 1997 saw a sharp increase in the amount of speculative construction in both the office and industrial categories, it pales in comparison to the amount of build-to-suit construction. Industry insiders also argue that the emphasis on “modular” low-rise and mid-rise developments — as opposed to the high-rise developments of the 1980s — will help ensure that the supply of speculative office space will not significantly outpace tenant demand. Those who view the Miller Global/Equity Office transaction as the sign of a market top argue that we are once again nearing the end of a “credit-fueled” economic expansion, similar to the credit-fueled expansion that ended during the mid-to-late 1980s. They believe that the Federal Reserve and commercial banks cause unending boom/bust cycles by artificially expanding — and later contracting — the supply of money and credit. The Federal Reserve expands the supply of money and credit either by buying Treasury Bills in the open market or by lowering the discount rate as a means of lowering short-term interest rates. As short-term interest rates fall, commercial banks tend to make more loans to both businesses and consumers. And when banks make more loans, they essentially create money that didn’t exist before. As businesses and consumers spend this borrowed money, the economy expands. This scenario describes what occurred in the U.S. economy during the early-to-mid 1980s. Many argue that this also describes what happened in the U.S. economy during the past several years. As with all good things, however, economic expansions too must come to an end. Like a fire, they either burn themselves out from lack of fuel or are put out by the Fed before the rage out of control. During the mid-to-late 1980s, concerns about the rate of inflation for goods and services, and a weak dollar, led the Fed to drastically tighten credit and thus “put out” that economic expansion. It is too soon to tell whether concerns about the rate of inflation — for goods, services or financial assets — will lead the Fed to put out this expansion. Or whether the Fed will allow this expansion to “burn out” on its own. Money Supply. First, in most business cycles, the growth in money accelerates as the business cycle matures. An accelerating growth in the money supply certainly explains the accelerating flow of investment capital into Denver real estate. David and Goliath. Further, despite outward appearances to the contrary, hordes of small “retail” investors are replacing a handful of “high net worth” investors as owners of a preponderance of Denver’s investment grade commercial real estate. Often, the arrival of the “little guy” signals the arrival of a market top. This brings us back to the potential significance of the Miller Global/Equity Office sale. Just as Prudential’s “PRISA” fund acquired City Center from MKDG on behalf of the small pension fund investor in 1983-1984, Equity Office Properties is acquiring Miller Global Holdings’ portfolio on behalf of the small REIT investor in 1998. While the investment vehicle may be different, the profile of the ultimate investor remains the same. It is human nature to forecast or project into the future in a linear fashion. Unfortunately, it is this propensity to project “linearly” that causes markets to behave “cyclically”. This entry was posted in Economics, Market Forecasts, Real Estate on October 9, 2013 by Jeff Peshut.